You’ve received the gift of live TV! Stream live TV instantly on your favorite devices, starting at just $20/mo. Watch ESPN, AMC, HGTV, CNN, Disney Channel, A&E, Comedy Central and more. No credit card required. Sling Orange ($20/mo) has the channels you want without the ones you don't. Watch live streaming sports, kids shows, movies & more: 25+ channels including ESPN, ESPN2, AMC, HGTV, CNN, A&E, TNT, Disney Channel, Freeform, Cartoon Network, Adult Swim, HISTORY, Comedy Central, Food Network, TBS, VICELAND, Travel Channel, IFC, El Rey Network, Bloomberg, Lifetime, & more. 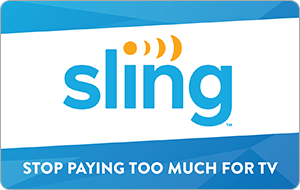 Sling Blue ($25/mo) has local favorites on FOX & NBC, regional sports (where available) on FOX Regional Sports Networks, and NFL Network. Plus, watch top shows on NBC, AMC, FX, FS1, CNN, HGTV, Comedy Central, USA, & more. FOX, NBC, Univision & UniMas live programming availability varies by location. UniMás, Azteca, AZ Clic, Univision Deportes, beIN Sports en Español, beIN Sports, AZ Cinema, Cinelatino, De Película, De Película Clásico, CineSony, Pasiones, & more. Cooking Channel, DIY Network, Lifetime Movie Network, Univision Deportes, beIN sports, EPIX & more! Check out www.Sling.com to see a current list of available channels and services. No credit card required for Gift Card redemption. Watch live streaming television anytime, anywhere: on your television, mobile phone, tablet, or laptop. iOS or Android device, or PC.